One Madison Park - 22 East 23rd Street - by Cetra/Ruddy Inc.
Thread: One Madison Park - 22 East 23rd Street - by Cetra/Ruddy Inc.
Last week, a residential developer from Rockland County purchased two two-story buildings at 20-22 E. 23rd St. and the air rights of the adjacent properties from a prominent New York City residential developer who had acquired the sites over the past 18 months. One of the sites previously housed a MdDonald's. 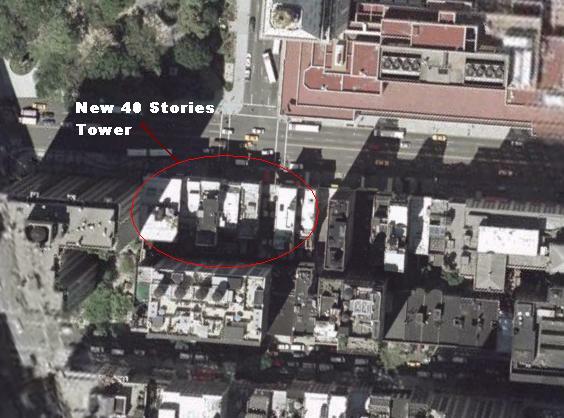 The new owner plans to demolish the buildings and construct a 40-story residential tower. Last edited by krulltime; January 26th, 2007 at 01:27 AM. That looks like a group of old buildings. Any street shots? They are older buildings, some of which are pretty attractive and others I could do without. The article says 2 two-story buildings. One of them is obviously the one in black, but where's the other? The adjacent buildings are all higher than 2 stories. The little black building and the nice grey one next to it will be razed. While the black one will be no loss, it will be a shame to lose the grey one, as there are several dilapidated buildings to the west of the black one including one housing a Wendy's. Hmm yeah, would have been better to kill Dunkin Donuts. I think the developers are Glenwood Management. Expect something hideous like all the rest of their buildings. There are seven buildings in that view. The overhead shot in the first post shows that there are eight buildings currently occupying the site. The second two-story building might be the building that's out-of-view. The article refers to 20-22 E. 23rd St. I walked by the site last week when I read this, and the buildings are the little black one and the grey one to the left of it.